This project is funded by the European Commission Horizon 2020 ICT30 call “Internet of Things and Platforms for Connected Smart Objects”, led by TU Kaiserslautern, Germany and involving 15 organizations from across Europe. The VICINITY project is looking specifically at interoperability between all parts of the Internet of Things (IoT). Since 24 of June that Easysening through the Energy and Environment Regional Agency of Algarve - Areal is a StakeHolder from SET-UP Interreg Europe European project. the goal is to improve energy performance of the partner regions thanks to enhanced policies on smart grids. It intends to identify efficient energy management tools, with a specific focus on challenges to smart grid deployment. On the past day 5 of July EasySensing by its CEO Sérgio Silva was on IDC - Internet of Things Forum organized by IDC Portugal on New University of Lisbon. Sergio Silva made a little presentation about the innovative solutions under development by the EasySensing team and its implementation in Algarve. EasySensing made also part of the Digital Transformation and IOT Panel - Innovative Solutions in Portugal. This panel discussed the development state of new IOT technologies and their expertise in implementing such solutions in Portugal. Dear customers, from today is available in our website a list of products of Atmos and Apogee Instruments companies. EasySensing is official reseller and integrator/reseller of these companies, respectively. The brochures of these products are also available but only in Portuguese. Subscribe our newsletter to be informed of our news! The EasySensing. - Intelligent Systems Ltd, has recently been accredited for the provision of consulting services under the Simplified Valleys in the areas of innovation and research and technological development under Portugal in 2020. The EasySensing technical team participated in the assembly 3D printer Workshop on the past 27 and 28 of June on the University of Algarve. In the Workshop the team acquired all knowledge needed to mount and operate a printer of this type. This printer will enable the design of custom boxes for the products developed by EasySensing. Within the framework of WIDER project last day July 31, 2014 was accepted a proposal to make the provision of services as expert. On July 28, 2014 the EasySensing participated in the Workshop on financing opportunities for companies in the energy sector in the context of the new framework programme HORIZON 2020, on the Algarve in Faro Tertulia. The session was organized by the Division of Entrepreneurship and technology transfer (CRIA) of the University of Algarve in order to warn and prepare the business community for the launch of the first contests of Horizon 2020. The EasySensing on its own initiative decided to participate in this event and was represented by Ricardo Pacheco (Department of management). On July 18, 2014, the University of the Algarve, in collaboration with the Technological Park of Andalusia, organized a meeting between some stakeholders of Malaga and the Algarve's stakeholders (companies, the respective clusters and universities) inserted in the sea sector. The goal of this meeting is the creation of synergies between the participating companies and presentation of I & D Centers UAlg. The EasySensing was represented by its CEO, Sergio Silva, who held a short presentation of the company to all participants at the event. As part of the Wider project, the EasySensing was present at a workshop in which the objective was to promote a generation of ideas for new products and services to people to the elderly population. 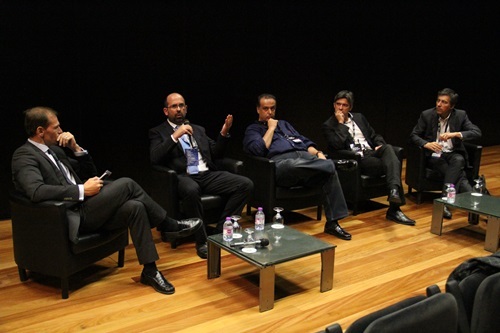 The EasySensing was represented by its CEO, Sérgio Silva. In the past day May 28, 2014 the Easysensing was present at the workshop programmes Innovation incentives HORIZON 2020 and new QREN, in the Auditorium of the Inovacenter in Loulé. The goal of the initiative is to promote the new funding opportunities and mechanisms for supporting innovation, research and development, and prepare the participation of companies in the national and community programmes. The company was invited by the Division of Entrepreneurship and technology transfer (CRIA) of the University of the Algarve and it was represented by Ricardo Pacheco (Department of management). On April 30, 2014 the EasySensing applied to the WIDER project as an expert in the development of studies in the areas of ID & T.
The WIDER project, co-financed by the MED programme aims to fund innovative projects that enable SMEs to reposition itself in the market through the development of products/services that contribute to the elderly live more independently and autonomously. In the Last 05 March 2014 EasySensing was presented in the Transnational Cooperation Group of the project ENERGEIA in Malta. The company was invited by the Division of Entrepreneurship and Technology Transfer(CRIA) of the University of Algarve and he was beed represented by the CEO Sérgio Silva.